The recent state visits by the Emir of Kuwait and the President of the Philippines did not faze the public very much in Brunei. The Brunei people are so accustomed to seeing heads of states and heads of governments visiting Brunei ever since Brunei became an independent nation in 1984. It was not the case before that. When Brunei was still a British Protectorate state, there was no regular visit of such prestige. Over the course of about eighty years prior to full independence, there were only visits by the British Monarch and members of the British Royal Family. When they visited Brunei, they were treated with great pomp and ceremony. During the reign of His Majesty Sultan Omar Ali Saifuddien Sa'adul Khairi Waddien, there were two such visits. It was sixty four years ago to this month that Her Royal Highness the Duchess of Kent and her son, the Duke of Kent visited Brunei. It was on October 21, 1952. The Duchess of Kent was Princess Marina, daughter of Prince Nicholas of Greece and her son was Prince Edward George Nicholas Paul Patrick. The Royal visitors were accompanied by the High Commissioner, Lady Rachel Davidson and Viscount Althrop. His Majesty himself greeted the arrival of the royal party together with the British Resident, Mr JCH Barcroft and members of the Brunei State Legislative Council. After inspecting the Guard of Honour, Her Royal Highness the Duchess of Kent accompanied by His Majesty were borne by a Royal Litter to the Council Chamber escorted by the bearers of the Brunei Royal Regalia. It was at the Council that an address of welcome was made by His Majesty to which Her Royal Highness made a reply. In the days when there was no official royal residence for visitors, the Duchess stayed at the British Residency at Jalan Subok. She stayed there for two nights before proceeding to Seria. A Royal Banquet was held in her honour by His Majesty at Istana Darul Hana. It would be eight years later before another visit took place. On February 28, 1959 His Royal Highness Prince Philip, the Duke of Edinburgh arrived in Brunei. The Duke of Edinburgh was accompanied by the former Governor of Hong Kong, Sir Alexander Graniham, the President of the British Association for the Advancement of Science, Admiral Lord Fraser of North cape, Squadron Leader J. Severne acting as Adjuntant and JBV Orr, the Duke's Confidential Secretary. The royal party arrived on the plane 'Heron' which was piloted by His Royal Highness himself. The Duke of Edinburgh first set foot on Brunei soil at 9.26 am at Anduki Airfield in Seria. A few minutes later, the crowd was able to view him when he was taken in an open car to Seria along the road thronged with people and school children, all happily waving the Brunei and British flags. At Seria, His Royal Highness was taken on a tour of an oil rig in operation, the Brunei Shell Petroleum Company's Trade School and the youth gathering at the Marina Padang. The Marina Padang is now an empty open area. In that area, there was once a cinema called the Marina. In the afternoon, the Duke's plane took off from Anduki and landed after a very short flight at Berakas Airport. This was the old Berakas Airport. That airport terminal is now used by the Government Printing Department and the runaway is now a road serving the many government ministries and departments in the Old Airport Complex area. On his arrival, His Majesty himself welcomed him. Accompanying His Majesty was the High Commissioner Sir Anthony Foster Abell, the British Resident Mr DC White and other State Dignitaries. From the airport, the royal motorcade was greeted by school children, scouts, girl guides, red cross and the public all lining up along the road. Prior to arriving at Istana Darul Hana, His Royal Highness officially declared open a new bridge which was named after him as the Edinburgh Bridge. This is the bridge that crosses over the river connecting Bandar Seri Begawan to the Batu Satu area. It used to be part of Jalan Sultan but it has now been renamed as Jalan Raja Isteri Pengiran Anak Saleha. At the Istana Darul Hana, the Duke was introduced to members of the Brunei Royal Family after which he received gifts on behalf of his children, the Prince of Wales and Princess Anne. The gift presented to the Prince was a scaled model of an 'Ajong' (Royal Barge) used in ancient times and named 'Sindaun'. In the evening, the Duke accompanied by His Majesty watched a firework display, decorated boats pageant and decorated houses of the Kampong Ayer from the deck of the MV Sultan. A State Banquet was also held. It was the next day, after inspecting the Guard of Honour and after bidding farewell to His Majesty that the Royal Party flew to North Borneo at around 9 am. It was in remembrance of the visit that a palace was built and named as the Istana Edinburgh. During the reign of Sultan Muhammad Jamalul Alam II, a visit by a member of the British Royal Family also took place. It was on May 19, 1922 when His Royal Highness the Prince of Wales arrived in Brunei. The Prince later became King Edward VIII in 1936 but after less than a year, he abdicated to marry an American lady, Mrs Wallis Simpson. Visiting Brunei was part of the Prince of Wales' tour of the Colonies and Protected States which began in 1919 and ended in 1931. His arrival was greeted by His Majesty and his chief ministers. 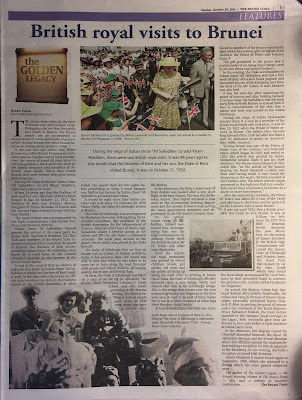 The Brunei Annual Report of 1922 noted that "on the arrival of the launch bearing the Royal Standard a salute was fired and having made a tour round the Kampong on the water, the Prince landed at the Customs Jetty. The Prince and the Sultan journeyed to the Audience Hall in a wonderfully carved litter of immense size borne by a dozen or more lusty bearers." At the Lapau, His Majesty gave the first public speech in English. After the welcoming ceremony the Prince of Wales was taken for a tour of the Tasek and after lunch, the Prince and his party left for the Customs Jetty to leave Brunei. It was not until 1972, that a British Monarch first came to visit Brunei. It was at 9.30 am on February 29, 1972 that HMY Britannia berthed alongside the new Muara Port. On the arrival of Queen Elizabeth II, the British High Commissioner welcomed Her Majesty, HRH Duke of Edinburgh and HRH Princess Anne. The Royal Party then departed by car for Datu Gandi where they board the Royal Barge accompanied by Court Ministers in their decorated boats to continue the journey to the Customs Wharf in Bandar Seri Begawan. On arrival, His Majesty Sultan Haji Hassanal Bolkiah personally welcomed Her Majesty. After inspecting the Guard of Honour under the command of His Royal Highness Prince Mohamed Bolkiah, the royal visitors traveled by the Usongan (Royal Carriage) to the Lapau. Both monarchs gave their addresses at the Lapau before a Royal Luncheon at Istana Darul Hana. In the afternoon, Her Majesty visited the Churchill Memorial Museum, the Omar Ali Saifuddien Mosque and the Brunei Museum where she officially opened the Museum before holding a reception for British nationals at the Residency. In the evening, she held a reception on board HMY Brittania. Her Majesty Queen Elizabeth II visited Brunei again in September 1998, where she returned to a Brunei which has since gained independence. I have a collection of First Day covers in Pristine condition. They are varied, some are British and some are Bruneian. I would like to sell them as I am not a stamp collector as such and think they deserve to be appreciated. I do not know how to contact you but my contact number is 7239663, my name is Rachael Malai Ali. I look forward to hearing from you.